Republic County USD 109 Superintendent Mike Couch came face to face with the reality of the teacher shortage in Kansas this month. At a recruitment fair at Kansas State University, there were 74 education majors attending—80 schools recruiting. At a similar event at Lindsborg: 20 education majors, 49schools recruiting. Most USD 109 vacancies for the 2019-20 school year are at the Jr. High/High School: Science, Social Studies, Family and Consumer Science, Vocal and Instrumental Music. There are generally more candidates for elementary positions than secondary jobs. And the competition between schools for staff “is going to get ugly”, he said. “I knew there was a crisis in a shortage of teachers,” he said. “What I’ve discovered is that it’s a crisis times three. Couch told the board that during his administrative career he has rarely had to attend recruitment events to search for teachers. Many education majors are already committed to school districts before the fairs are held. The Kansas Department of Education reported 612 unfilled teaching positions in Kansas at the start of school this year. That’s up from 513 vacant positions the same time last year. 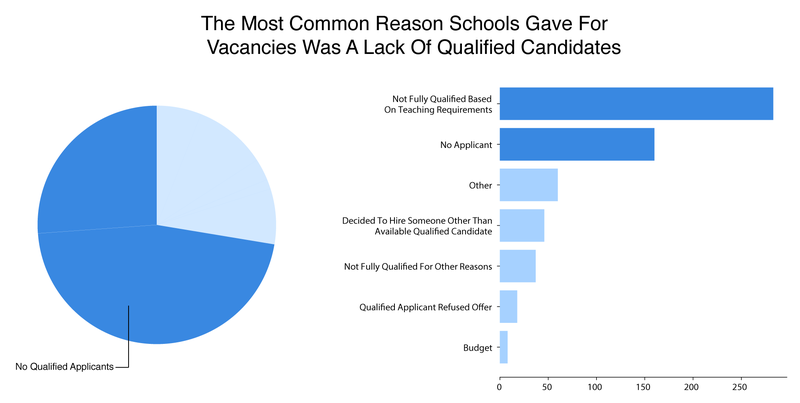 A survey of schools shows that the main reason superintendents said positions remained unfilled by a qualified teacher was not their current budgets, but a lack of applicants. About seven of 10 vacant positions remained so because there were either no applicants or the applicants that did apply did not meet the state standards. Low unemployment numbers could also cause a shortage of candidates, say experts. “When the overall economy is good and there’s jobs and wages generally rising, that tends to make teacher shortages worse,” saidMark Tallman, associate executive director of the Kansas Association ofSchool Boards. “Nationally, teachers’salaries have not kept up with salaries for other similarly educated workers,” Tallman said. 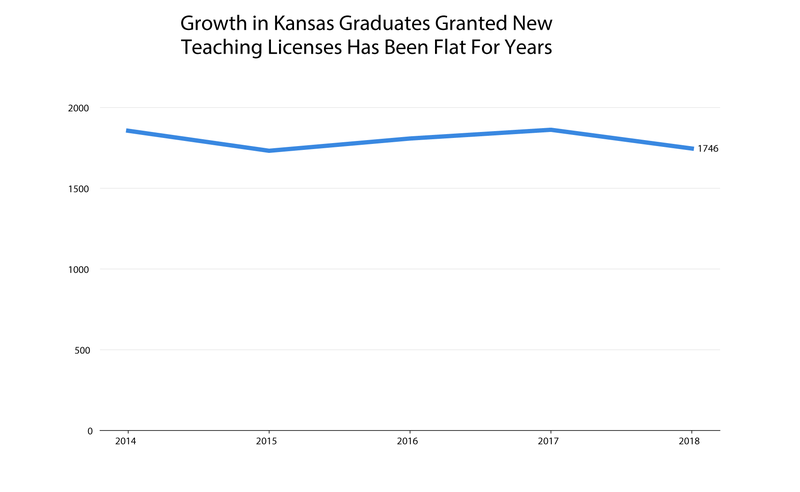 A negative perception of teaching could be why there has been little growth in first-time teaching licenses in the state. Fewer licenses were given to recent graduates in 2018 than the previous year. The state put into place two new pilot programs early this year to quickly qualify teachers for the classroom. Both are aimed at potential elementary and special education teachers. The program allows people with a college degree outside of education to start working as teachers while they finish a two-year program. There has also been an increase in waivers that let teachers cover disciplines where they are not qualified. 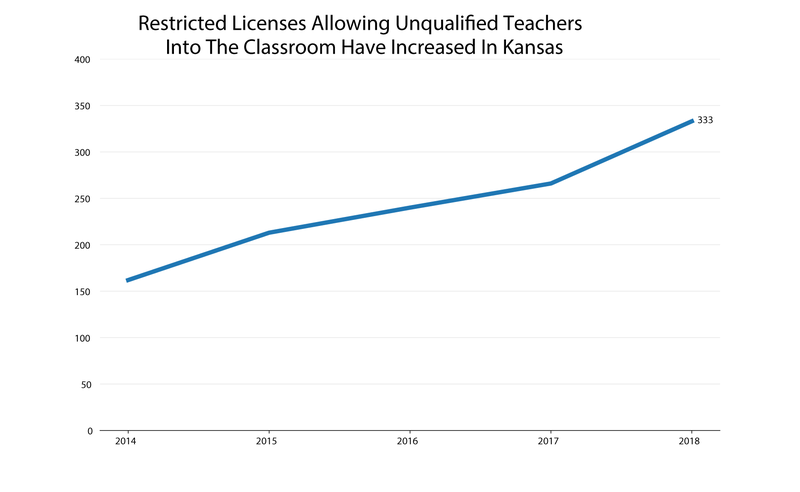 “Simply just wiping out licensure requirements and certification has a tremendous impact on students,” said Marcus Baltzell, director of communications for the Kansas National Educators Association. Couch also worries that districts will be forced to “settle when we hire”. “That’s not going to be good for public education,” he said. Stephen Bisaha, education reporter, and Celia Llopis-Jensen of the Kansas News Service contributed to this story. A story with graphs can be found at https://www.kmuw.org/post/kansas-worsening-teacher-shortage-four-graphs(seen below).